Australia's first Irish club has secured its future thanks to some quick-thinking real estate strategy and a once-in-a-lifetime planning minister. In an off-market deal, the 126-year-old Celtic Club has sold its 316-320 Queen Street headquarters to developer Buildcorp, which is expected to replace airspace above the historic building with a 48-level tower. If approved by Committee members next month, the Celtic Club will use the $12 million pocketed from the sale to find alternative premises. Throughout the planning process it was expected the club would occupy the lower levels of a Queen Street redevelopment and reap about $10 million from the sale of airspace. However in a presentation delivered to members on Tuesday, a preferred second option was to sell the property for the higher price with vacant possession. The site is worth more to a developer if lower levels could be fitted with apartments instead of clubrooms, conference centres and restaurant spaces for the Celtic Club. A first year architecture student can probably do better than that. not sure if this reads as being redeveloped with CC staying in place or redeveloped CC space minus tower? 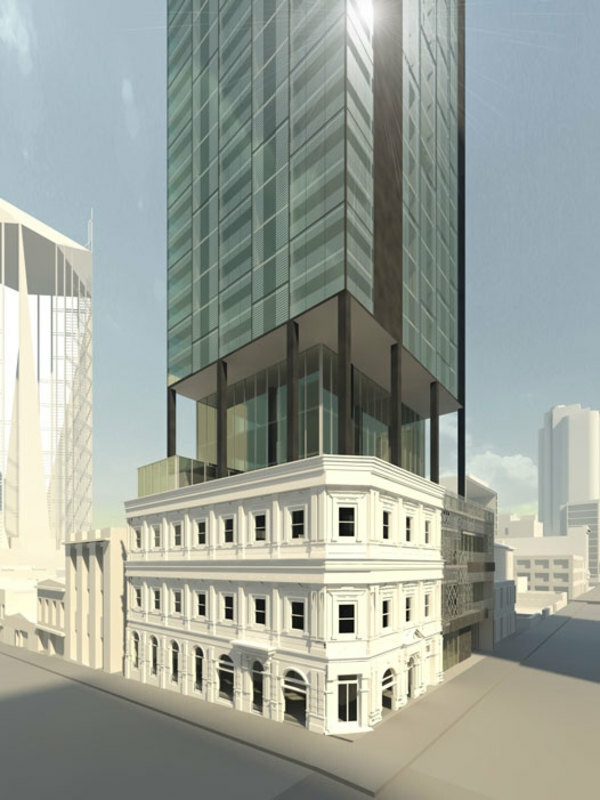 A deal that would have seen the headquarters of Australia's first Irish club sold and converted into a 48-storey tower has been narrowly voted down. The Celtic Club needed two thirds of its members to approve the $13.2-million sale to developer Buildcorp, but fell just short during a heated meeting last month. Club secretary Peter Gavin said they would now investigate other options to address their $1.5 million debt, including returning to original redevelopment plans that would see the club continue to occupy the lower levels of the 320 Queen Street. The committee which leads Australia's oldest Irish club has finally lobbied enough members to sell its prime headquarters and relocate to another site within the CBD. 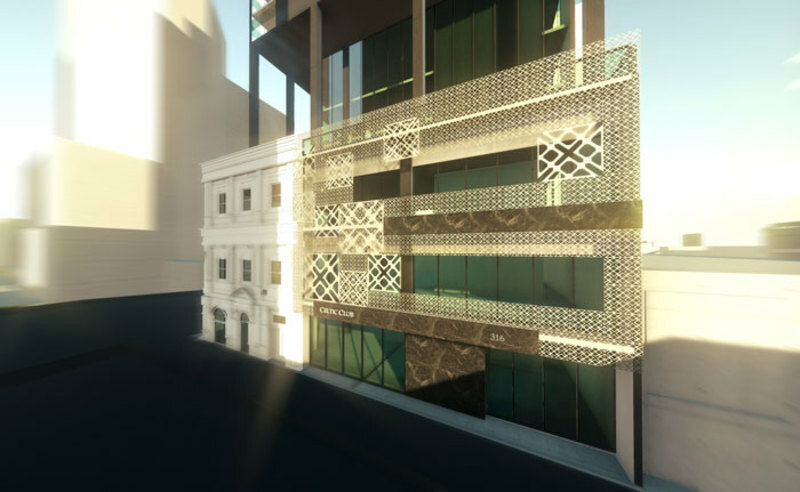 In a move claimed will save the Celtic Club from financial troubles, 316-320 Queen Street, on the south-east corner of La Trobe Street, is quietly being offered to developers in a deal speculated will top $25 million. The committee has sought to increase the value of the 676-square-metre block in recent years and discreetly find a buyer. In late 2012, it won approval from former planning minister Matthew Guy for a 45-level, 256-unit residential tower. By mid-2013, after another off-market campaign, the club inked a deal with developer Buildcorp which would have meant it banked $12 million for the Queen Street airspace and occupied the lower four levels of the new development. However, when just 62 per cent of members voted in favour (when the club requirement for a motion was two-thirds), that deal was torn up. At a recent meeting, nearly 90 per cent of members voted for a sale. Advocates argue that, as well as a cash injection to counter the dwindling membership, a more flexible Celtic Club premises would allow for other revenue streams. The Celtic Club site is identified by a heritage-protected three-level Victorian-rendered building, which was a hotel until 1959. I hope they don't screw this up. 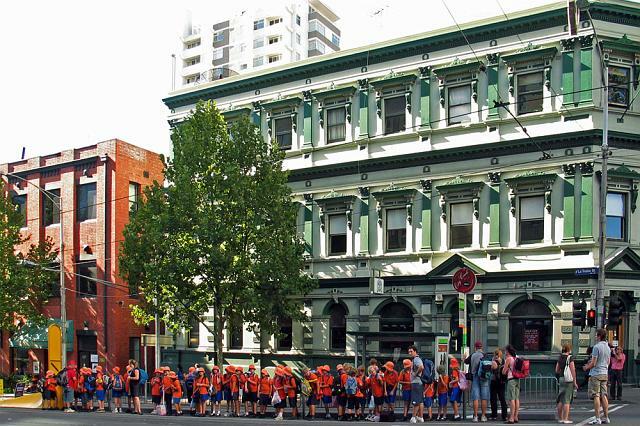 So, the Celtic Club chooses to leave Melbourne and it's cultural heritage poorer than it found it, abandoning an iconic Victorian era building to be gutted and facaded. Thanks for nothing, Celtic Club. Sometimes it pays to delay. The on-again off-again plans for the city's well-known Celtic Club are back on the agenda, with agents CBRE appointed to run an expression-of-interest campaign for its sale or redevelopment. A sale in 2013 was abandoned due to ructions within the club. Then, selling the building was set to bring in $13.2 million. If sold now, the club is likely to achieve a sale price upwards of $25 million. 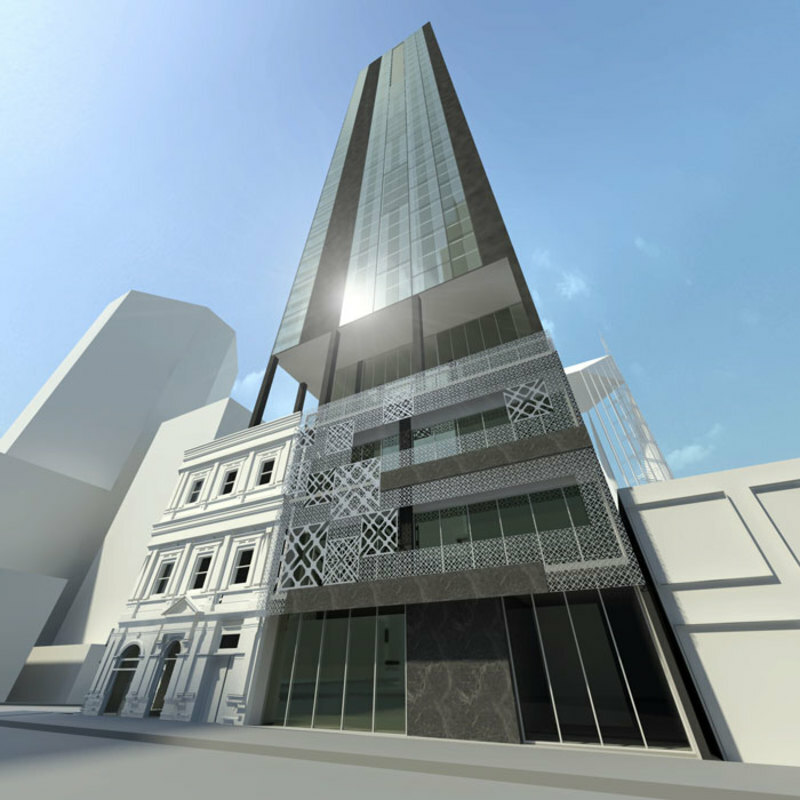 Redevelopment of the 140-year-old building will have to retain the structure's heritage facade which the club has inhabited on the corner of Queen and La Trobe streets since 1959. 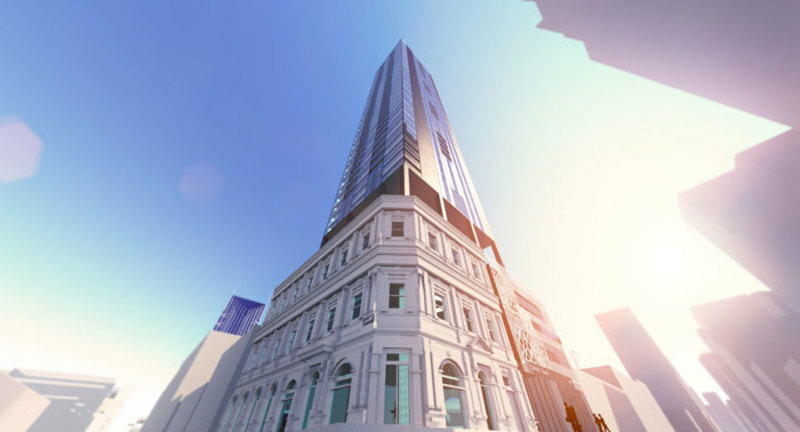 Former planning minister Matthew Guy gave the club permission to build a 48-level apartment tower on the site. Current minister Richard Wynne approved an extension of that permit until next October. The permit, for 256 apartments and 3000 square metres for the Celtic Club, was granted under Mr Guy's less rigid planning laws, and will attract a higher sale price. "We are going for either a straight sale or a redevelopment where we move out for three years, then come back into the building and we have the bottom four floors," said president and former Melbourne City councillor Brian Shanahan. The proposed sale has set off a chain reaction with developers also circling a neighbouring block at 310 Queen Street belonging to the KAPS Institute of Management. Multiple Melbourne developers have unsuccessfully lobbied the owners of both sites for nearly a decade to merge and sell the blocks. If combined with its neighbour, the Celtic Club would make a 1274-square-metre supersite – a much more attractive proposition for developers, said Colliers International agent Matthew Stagg. Veteran Melbourne property developer Tony Brady is a member of the Celtic Club and thought to be interested in both locations. Brady Group has constructed multiple towers in the northern end of the city and is building the soaring Vision Apartments at 500 Elizabeth Street. Turning a multi-storey heritage building into a mere facade tacked on to the foot of a tower. Good heritage policy? Good planning? Good result for Melbourne? Agree, this is quite a loss. You need to do your homework....it was never going to be just a facade, most of the original building is planned to stay. And your evidence that "...most of the original building is planned to stay" is where, exactly, Michael? What's the point Bilby? I suspect you'd never be satisfied. I'll just start again, then, shall I? "Turning a multi-storey heritage building into a mere facade tacked on to the foot of a tower. Good heritage policy? Good planning? Good result for Melbourne?" "Whilst the interior of the old hotel on the corner is to be demolished a significant outcome for the site is the investment in retaining the building facade ..."
"The site contains an existing building of historic interest having regard to its design and detailing which is visible from the street. This building is located on the south east corner of La Trobe and Queen Street and occupies the most prominent edge of the subject site. The existing facade of the building is being retained as part of the site’s redevelopment." 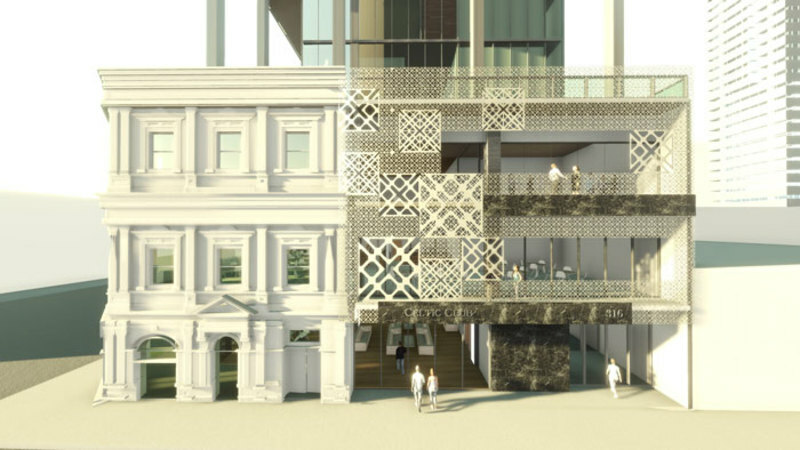 To demolish part of the existing buildings and construction of a 48 level (154.4 metre) residential building above a 3 storey heritage facade podium containing the existing Celtic Club ..."
Good on you Bilby, an absolute disgrace. Call this architecture? A box stuck on stilts above a false wall looks hideous.Just who approved this circus?? Thanks for that, I was honestly under the impression that more of the building was being retained. I stand corrected. Members of one of Melbourne's most volatile clubs, the Celtic Club, are poised to vote this Thursday on a deal to sell their Queen Street digs for $26.5 million. The value of the Celtic Club's Queen Street premises, a 140-year-old three-storey hotel, has more than doubled since the last offer was received in 2013. That deal was abandoned amid great controversy and there is plenty raging this time too. The club's rules require that 75 per cent of voters – not 75 per cent of the 900-plus members – must be in favour of the offer, which was negotiated by agents CBRE, if the deal is to proceed. Celtic Club president and former city councillor Brian Shanahan is fronting the sell camp while two of the committee of management's eight members – the main office bearers, secretary Felicity Allen and treasurer Daniel Thorpe – are campaigning against the deal. Or at least for the publication of more information about the pros and cons of selling the site. Mr Shanahan described the opposition to selling the club as a "feral campaign" that could cost the club millions. "There's a permit for a 48-storey building that runs out in October 2017. We have to do the deal now so that they can use it. If we don't stitch this deal up, it will cost the club $10-15 million," Mr Shanahan said. 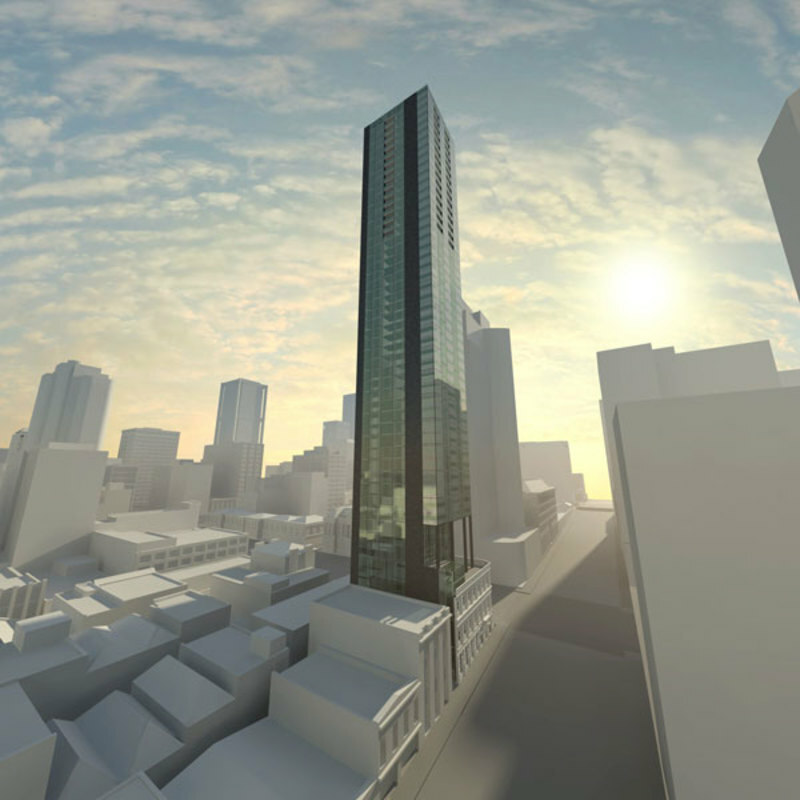 Former planning minister Matthew Guy issued planning permission for a 48-level tower on the site and the current Planning Minister Richard Wynne extended the permit in March. New planning rules could limit the scale of new plans. Mr Shanahan said the buyer is a highly respected developer and the deal would prevent the Celtic Club from going the way of other city clubs. The cash would be used to buy new premises and pay off debts. Shame on the Celtic Club if they allow this heritage wrecking development to proceed. Turning one of Melbourne's most elegant Victorian commercial buildings into a tacked on facade is an abominable "gift" to the future of this city. According to some it's nothing more than a "derelict dump". So why is the Minister extending this permit, when he explicitly denied the Windsor developers the same rights?? and not sure where Fairfax's "New planning rules could limit the scale of new plans" comes from in the same sentence as they acknowledge the Minister has extended the non-compliant permit, thereby ensuring the new rules will do no such thing. Show me where I called THIS site a derelict dump?